Happy Sunday everyone. I want to thank Lazyhaze first of all for nominating me for this award 🙂 They have a remarkable site, so do make sure you stop by to visit. Hello everyone. How’s your day going? I hope everything is going your way 🙂 Well, I have some news to share. 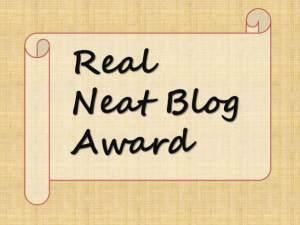 I was nominated for the Real Neat Blogger Award. 🙂 Now, I actually took a short break from accepting a few awards, but this one has very simple rules, & I’m in a good mood, so decided to participate. I’d like to thank sparklingpoems.wordpress.com first of all, for nominating me. Their blog is really awesome…very inspiring, so please do check it out. First of all, I’d like to thank, amileinmyshoes.co for choosing me for the Sunshine Blogger Award 🙂 She has an amazing site, so be sure to check it out. To give some background on my blog, for those of you who are unfamiliar, I’m a Children’s Book Author. (Click on my sidebar) I have also cared for children as a Professional Nanny. I began my blog as a platform for my books, as well as a way to share more inspiring & informative content with adults & parents. You can also read more on my About page. Display award on your post and write about it. Give a brief history of your blog.